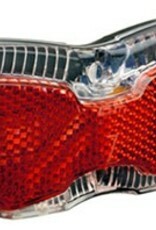 This is Busch & Mueller's Toplight View Brake Tec with pulsing brake light function. Not quite as bright as the very bright Toplight Line, the Toplight View is still quite bright and will get the attention of drivers. 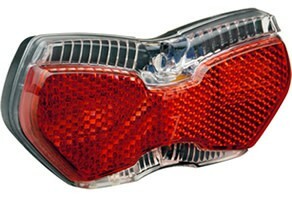 The light from two LEDs is spread across the top and bottom of the taillight with a reflector in the middle. The Toplight View Plus is compatible with all 6 volt Busch & Müller headlights, including the Luxos U, as well as all Schmidt and Spanninga headlights. It is not compatible with Supernova headlights. The mounting bolts are mounted at the most common 50mm spacing, but can easily be moved to 80mm if you prefer. No taillight wire is included.